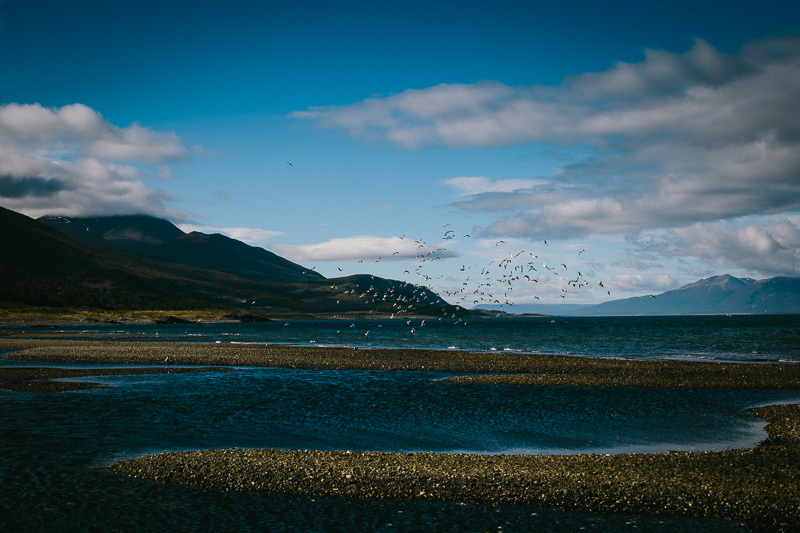 The most southerly city in the world, Ushuaia, is the established finale for most pan-American odysseys. 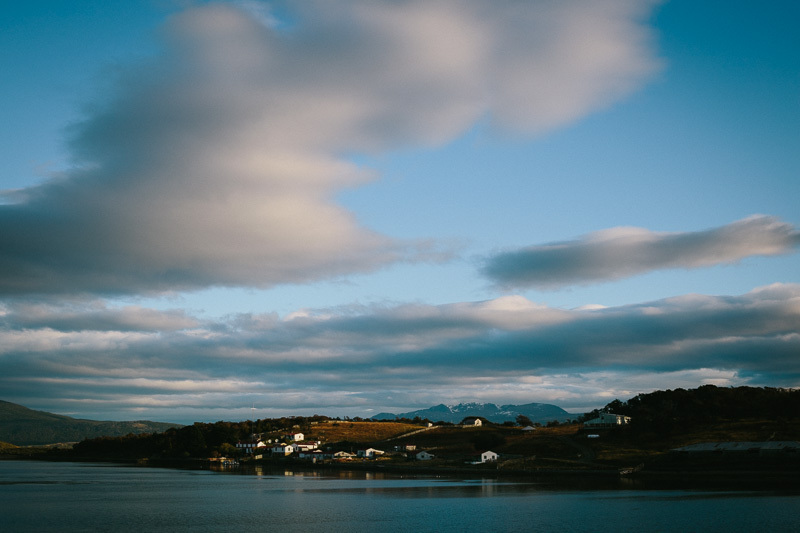 Once there, our original intention was to push the envelope just a little further, catching a ride across the Beagle Channel to Puerto Williams, on Chile’s Isla Navarino. 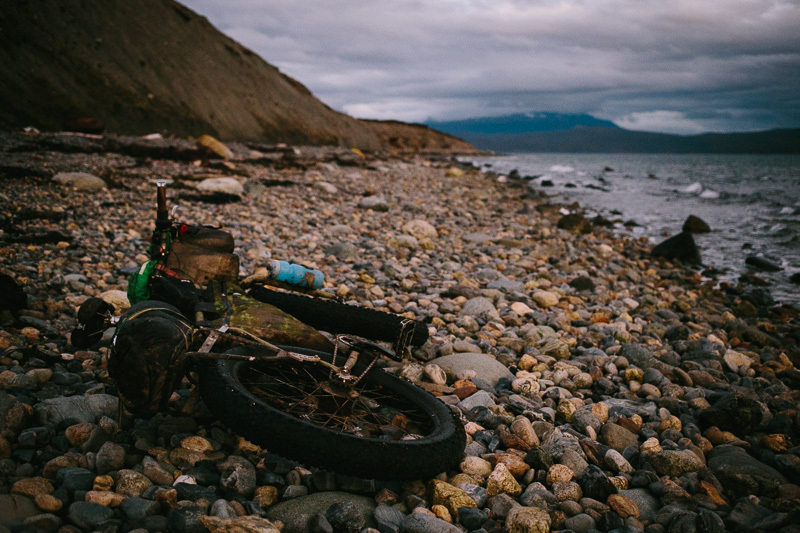 There, we hoped to bikepack to the world’s most southerly community – Puerto Toro, home to 42 souls. Unfortunately cost, logistics, snow – and some doubt as to whether there was an actual trail on the ground – conspired to prevent this. So instead, Skyler, Panthea and I diverted our attention to a coastal trail we’d previously briefly explored, turning it into a two night bikepack to the historic Estancia Harberton, following first singletrack, then beach, then dirt roads.. Graced with fine weather, it proved the perfect way to celebrate the end of this wonderful Patagonian adventure. Steeped in history, Estancia Harberton was founded by Thomas Bridges (1842-1898), who inherited his name from the Bristolian bridge under which he was found. 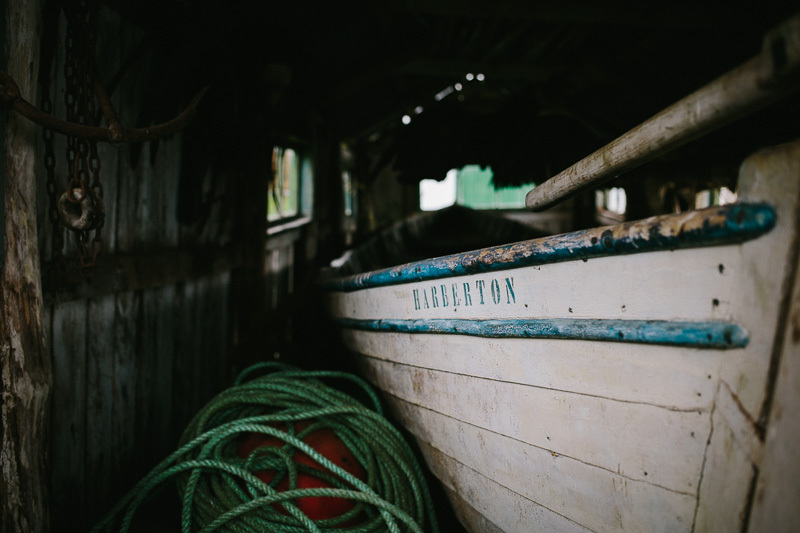 The main house was transported to Tierra del Fuego by ship, in pieces, all the way from Harberton, Devon. It was the first estancia on the island, and despite their missionary tendencies, the Bridges were said to be unusually progressive in their rapport with the local Yanama people – especially compared to other Europeans of the day. 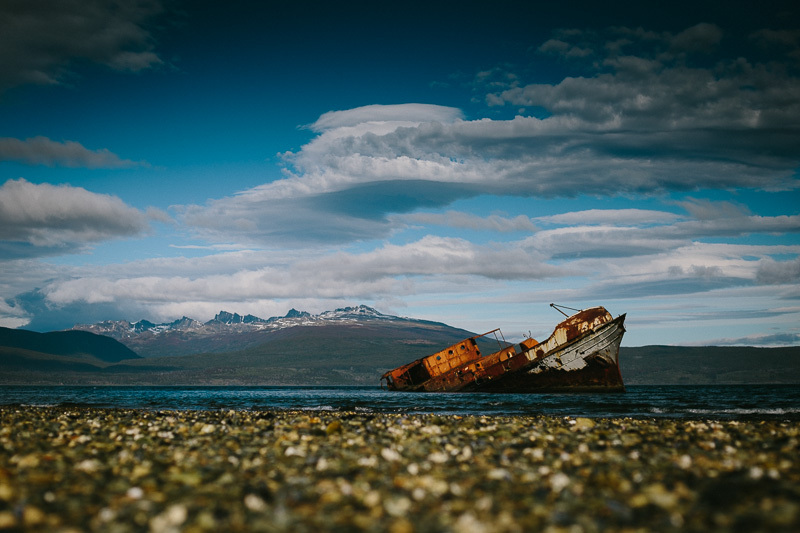 In fact, the 50,000 acre swathe of land upon which the estancia is located was a donation from the Argentine National Congress, in recognition of his work the Yanama, and with shipwrecked sailors of Cape Horn. Today, the farm is managed by Tommy Goodall, great grandson of Thomas Bridges, and Natalie Goodall, his biologist wife. A note: to anyone heading south next year, and travelling light enough (there’s one short but particularly evil bushwack), this route would make a fantastic way to arrive in Ushuaia. 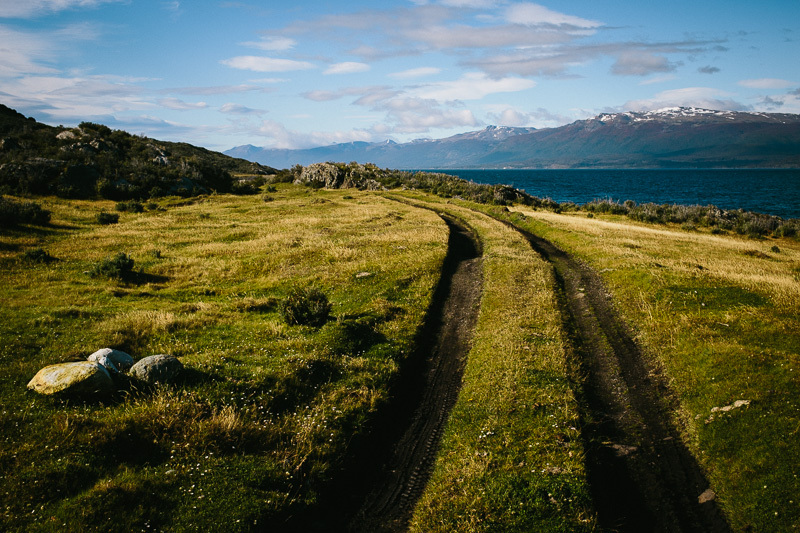 In fact, it’s possible to knit together several dirt road alternatives between Tolhuin Ushuaia, and make what is generally a single, long day on pavement, into a 2-3 day Dirt Road Special. And if you make it to Puerto Toro, please let me know if there’s a trail! If you would like to keep up with where I am between blog entries, I try and keep my While Out Riding Facebook page regularly updated – along with posting extra photos and gear ponderings. You can find it here. 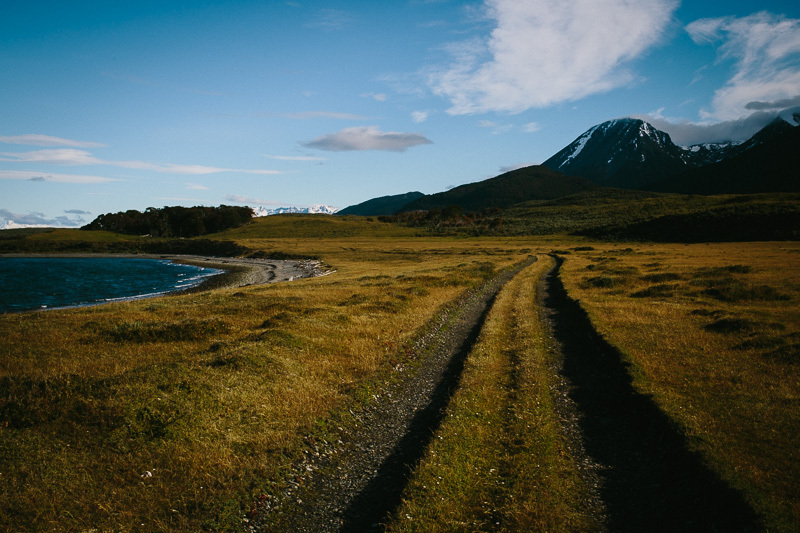 The first section of the trail, which begins 10km south east of Ushuaia, is nothing short of sublime (see more pictures here). 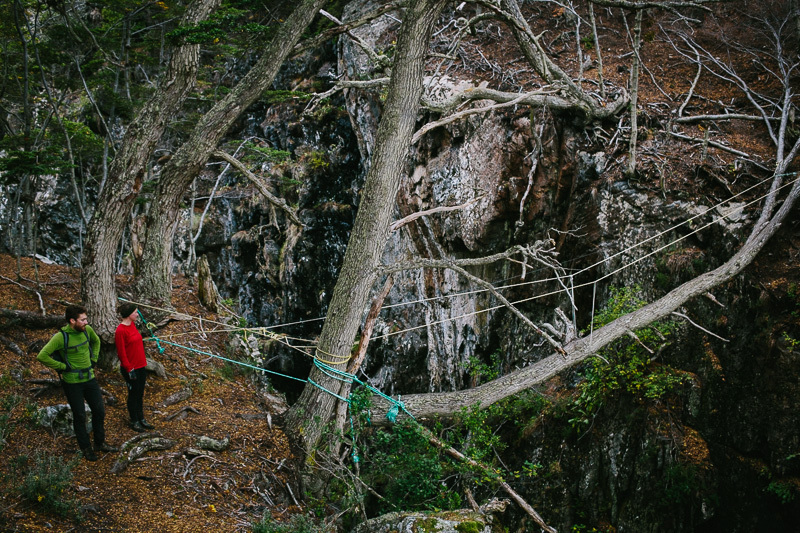 Eventually, things get a little Interesting… like this tree, split at its trunk, that provides a gangplank to the other side of a particularly deep gorge. Given the sheer drop below us, we opt to give it a miss and forde the river downstream instead. 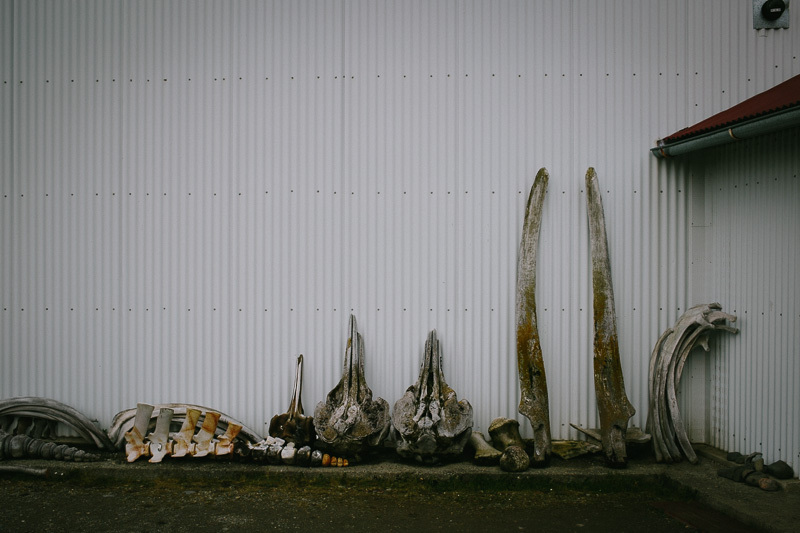 … until we finally emerge on a stony beach. 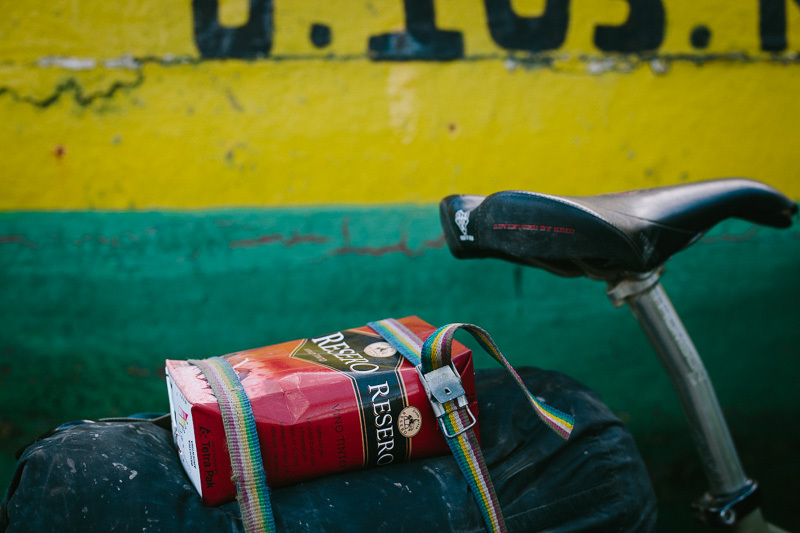 No problem for the El Poderosa; this bicycle munches up pebbly oatmeal for breakfast. Can’t stop smiling! A late, post-lunch start means there’s no time to dally. 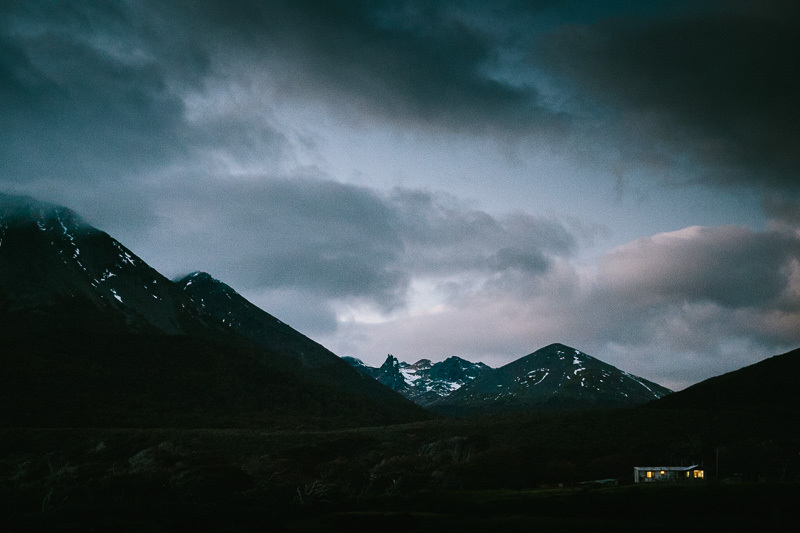 Best find a roof for the night, before these moody views out to Chile’s Isla de Navarino – across the Beagle Channel – are lost to darkness. At least he recommends possible accommodation. 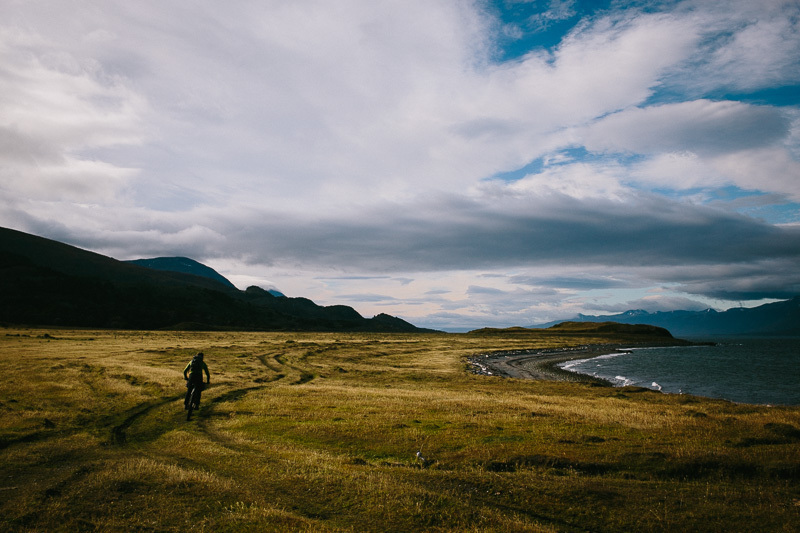 We follow first a tractor trail, then pick our way along the beach by torchlight. It’s not easy to find in the dark, but when we do, this cuboid cell does the job nicely. Daylight reveals the full spendour of our home. Bikeshacking perfection. it even comes complete with a sock-drying rack. 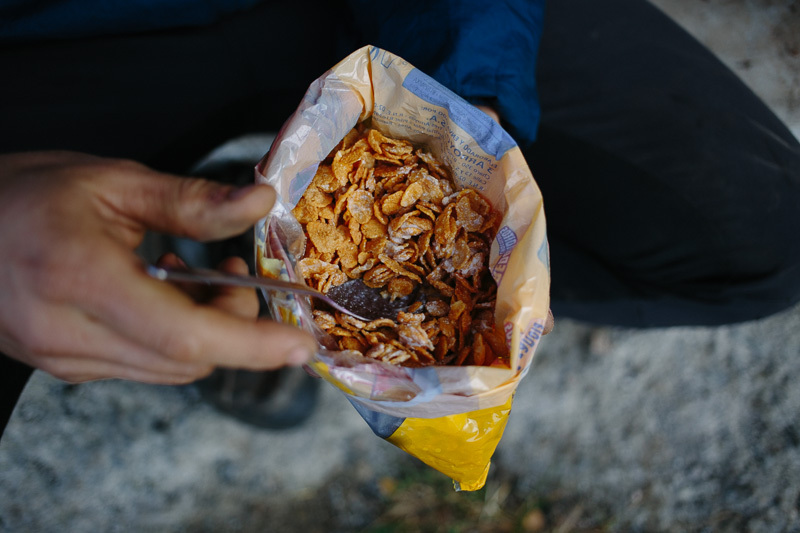 A breakfast of champions. This is Skyler’s minimal rendition of a bowl. And that’s one cruddy chain. It’s at times like this that I consider the merits of a belt drive. 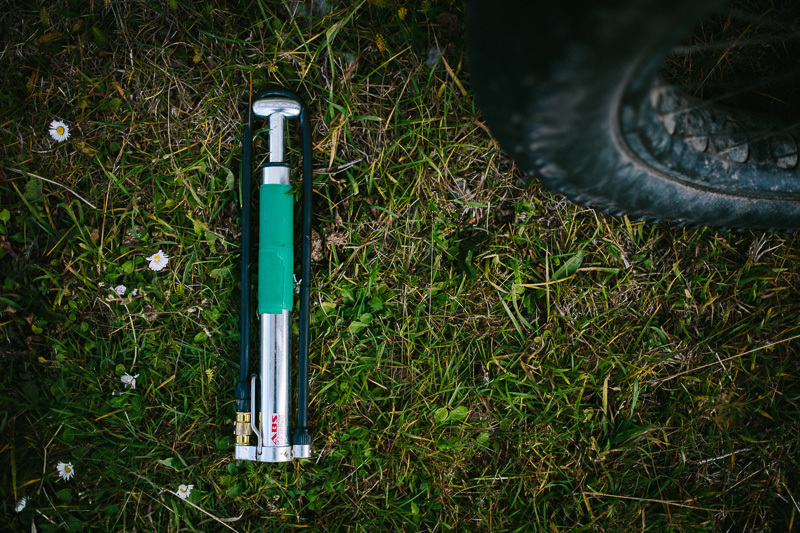 In other gear talk… For fat tyre touring, regular pressure tweaks are de rigueur. This Lezyne pump is beautifully made, and works a treat. The next morning, an inviting two track leads us further along the coast. Two track heaven! If you’re ever questioned the merits of travelling light, this would be the reason. 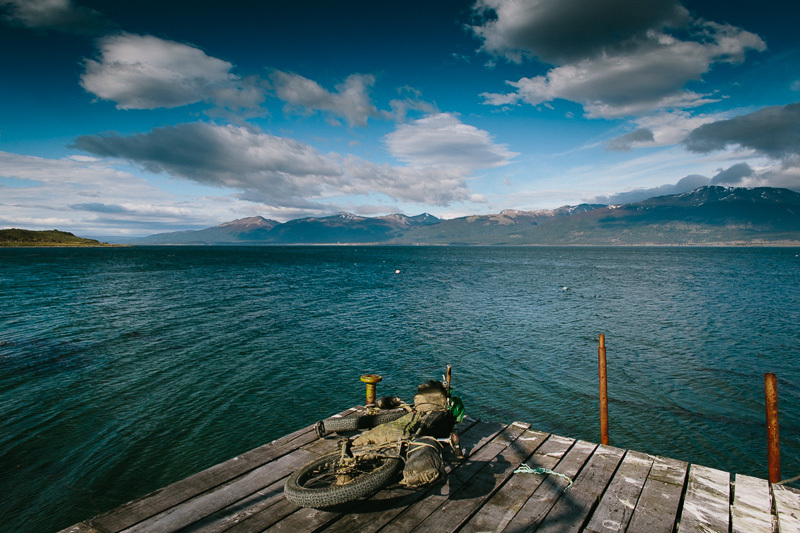 The Beagle Channel, dividing Argentinian Tierra del Fuego from Chilean Isla Navarino. And here it is in flesh. 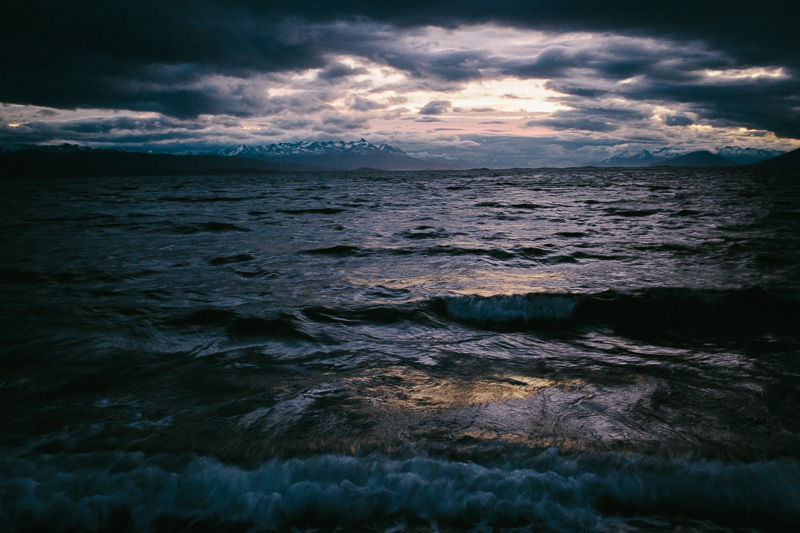 Across its precarious waters, the Dientes del Navarino – the Teeth of Navarino – can be seen. Just us and the birds. 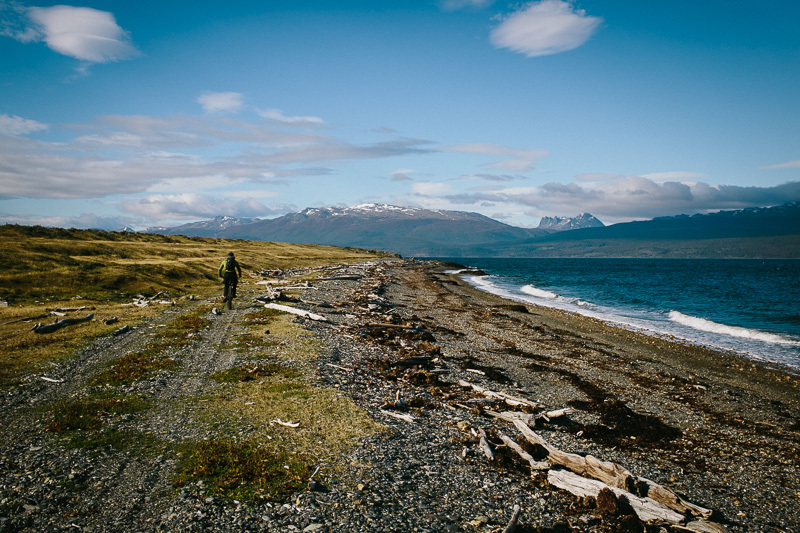 Then, we leave the shore and hit a gravel road once more. Luckily, there’s no one around to see us we surreptitiously hop the fence. A great lunchtime spot – though the photo doesn’t quite convey the howling wind threatening to hurl drying socks out to sea. To celebrate our final night camping in Patagonia, we splash out on a $1 carton of wine in Puerto Almanza. Then, it’s just another 15kms of rolling dirt road to our destination. … catching the last light of a pristine autumnal day. 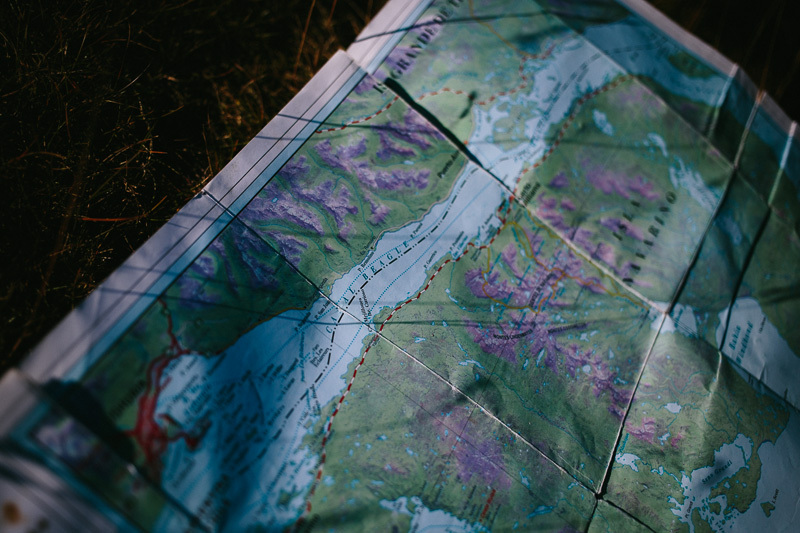 … we find our promised digs for the night. 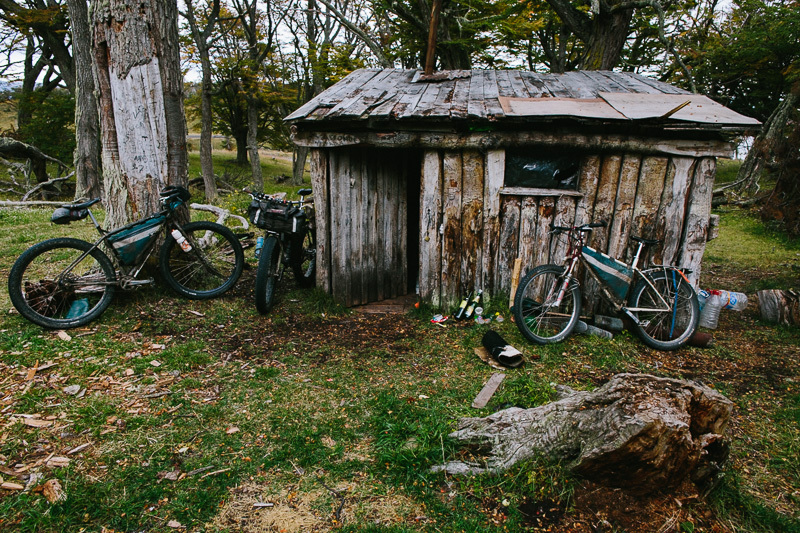 With a roaring fire, it makes for a toasty evening, and a fine addition to our collection of Bikeshacking lodgings in southern Patagonia. 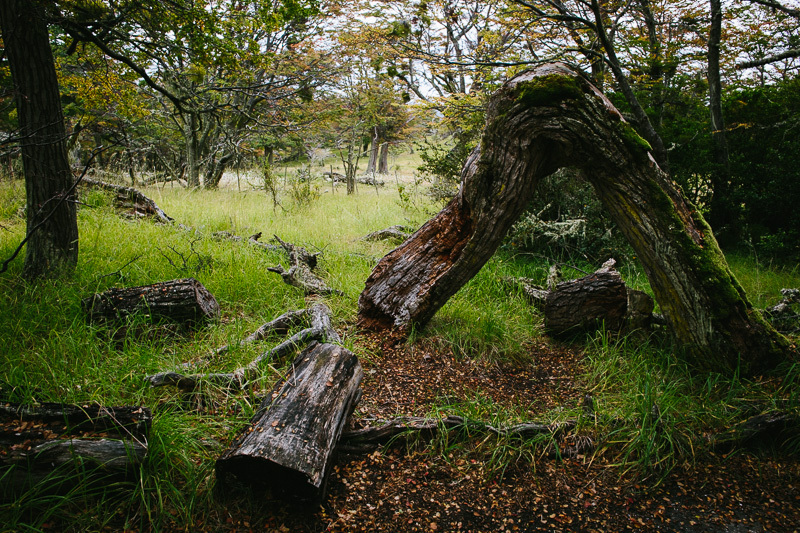 Estancia Harberton, all but unchanged since it was founded in 1886. Its wood buildings are clad in the original corrugated iron, and its beautiful gardens are still divided by stone terraces constructed by the Yanama people. 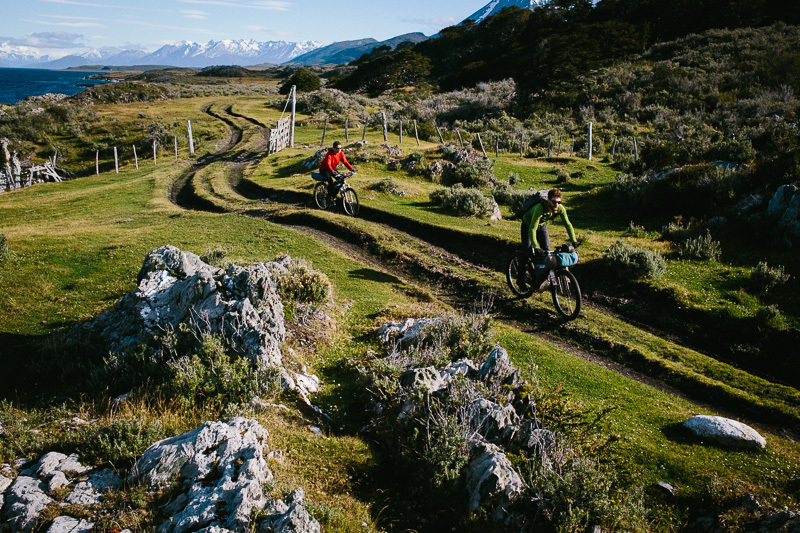 We take a tour of the grounds, guided by a Argentinian rural tourism student – who also happens to be a cyclist with 20,000km on the continent to his name. 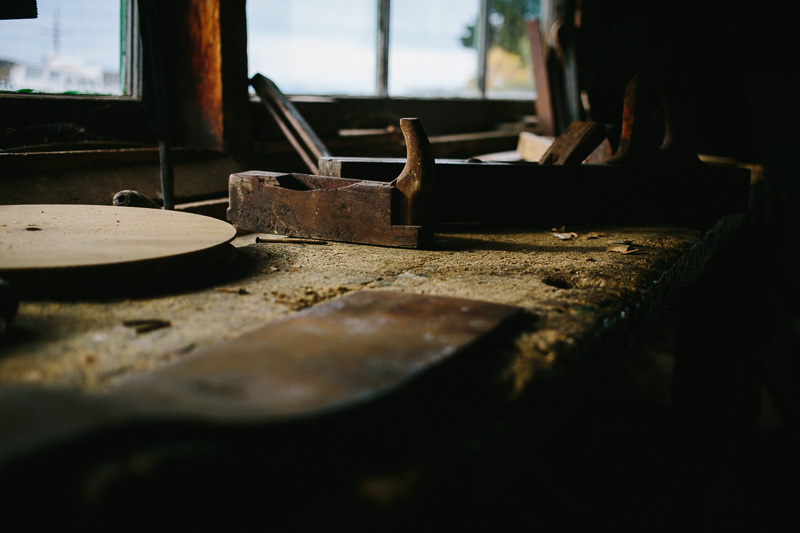 This is the estancia’s workshop – most of the original tools are still in regular use. An whaling boat from the late 19th Century – though it was used for transportation by the estancia, as the Bridges discouraged exploitative whale and seal hunting. Family memorabilia. 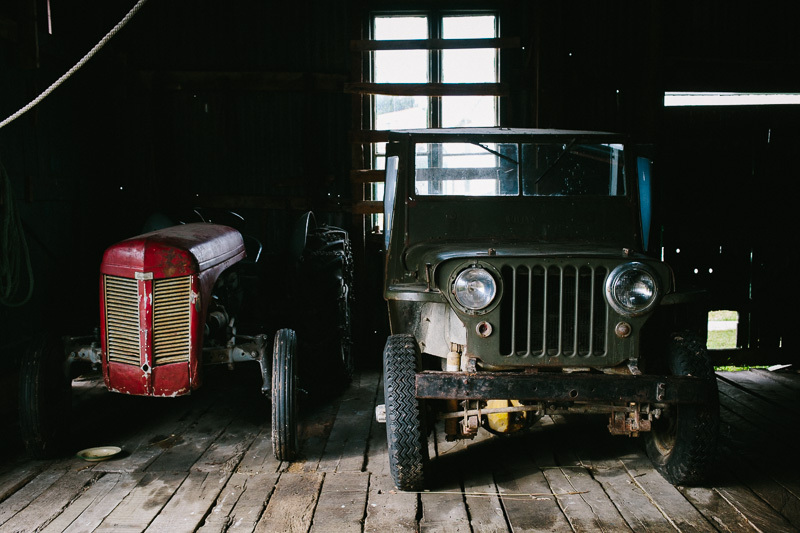 In the 1960s, the current manager of the estancia, the great grandson of Thomas Bridges, used this jeep to cut a road through the forest, linking the estancia to the main road for the first time. 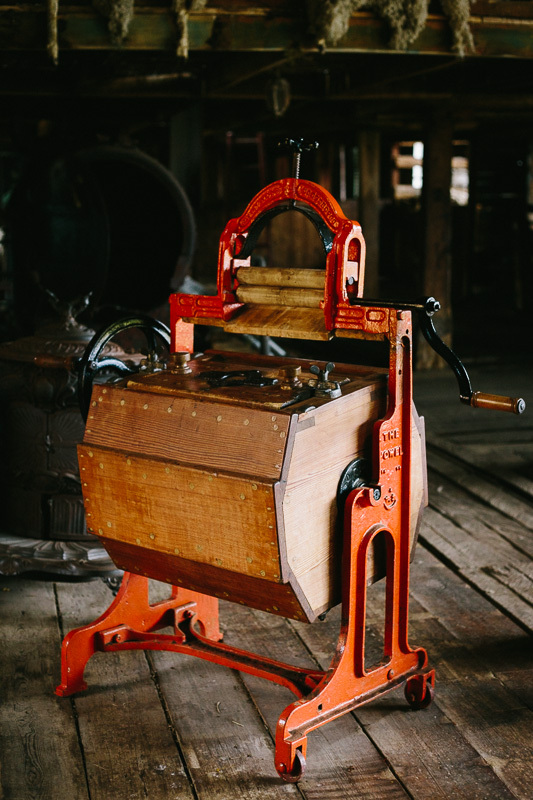 Back in the day, this was the latest in eco-friendly washing machine technology. 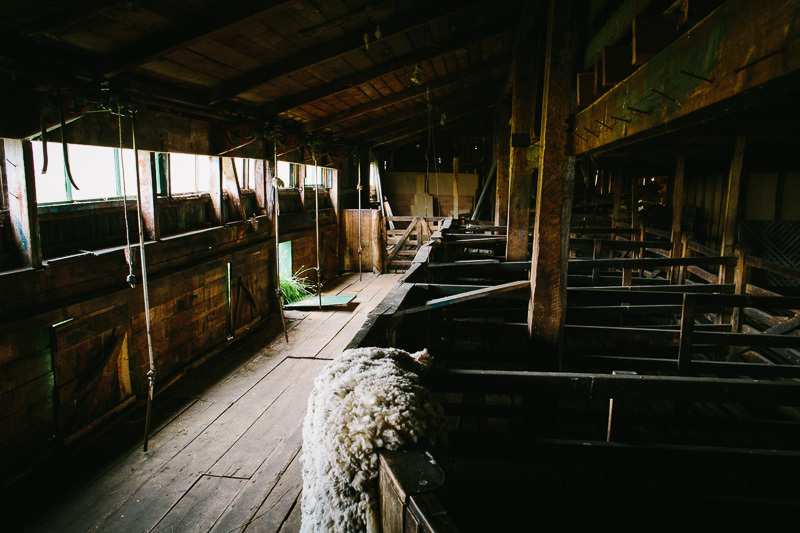 Although sheep are no longer raised on the farm, the perfectly preserved shearing shed is another insight into Patagonian history. 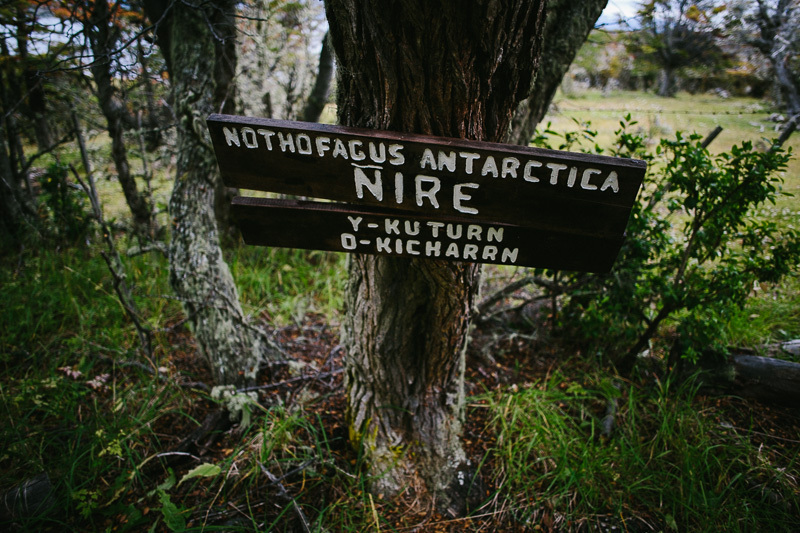 A marked trail leads us through a variety of fauna we’ve seen throughtout Patagonia, including Nothofacus Antartica – our companions for many a mile. As any cyclist will tell you, these ‘flag trees’ foretell either a soul-destroying battle into the elements, or a fabulous tailwind. An ‘elbow’ tree, as it’s known, ideally shaped for constructing the inner ribs of local boats. 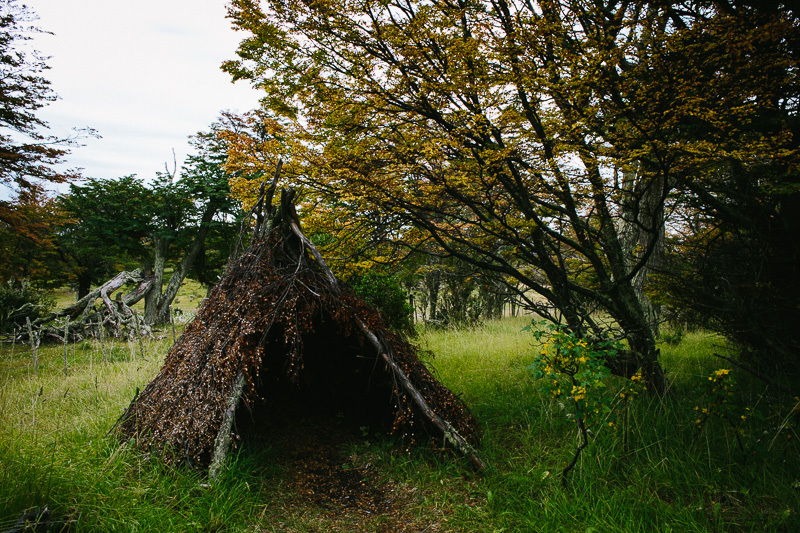 Within the grounds, there’s also a couple of replica Yanama dwellings. 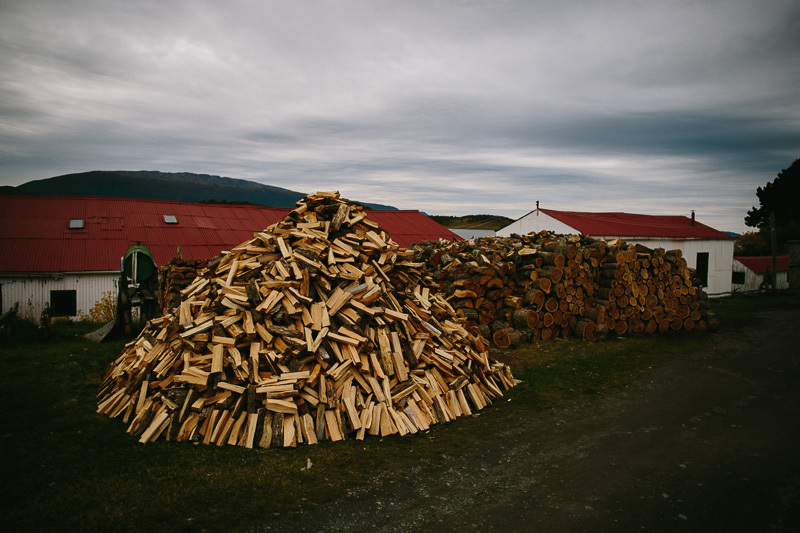 The Yanama were known for their skills in maintaining fires – hence the name, Tierra del Fuego – Land of Fires. 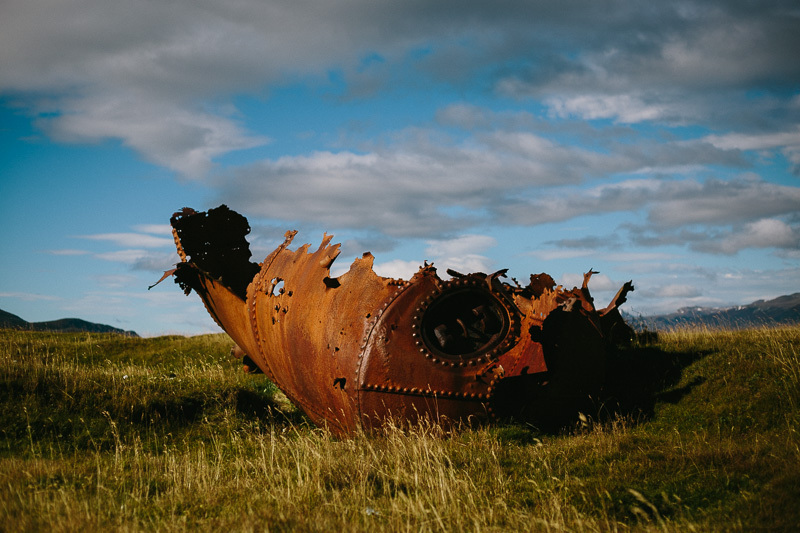 They transported fire everywhere they went, even within their boats when they fished – ultralight husks fabricated from tree bark. Preparing for colder times. 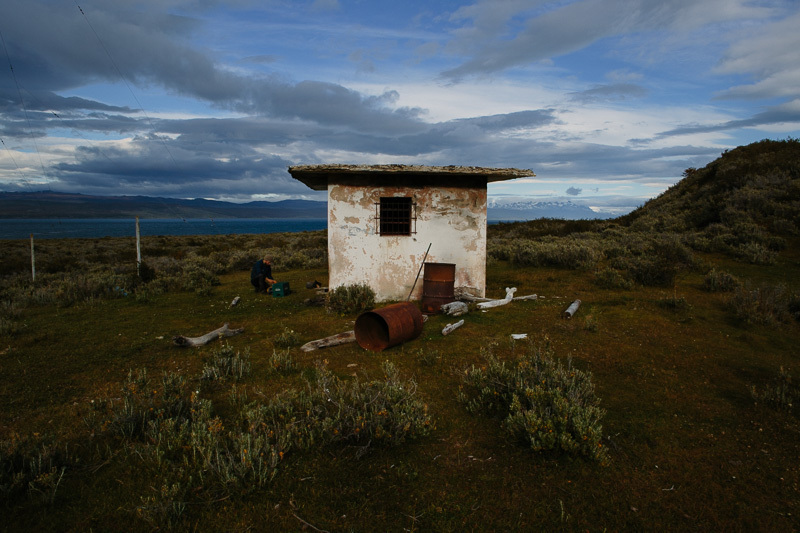 The estancia closes its doors to visitors in mid April, to weather the winter alone. 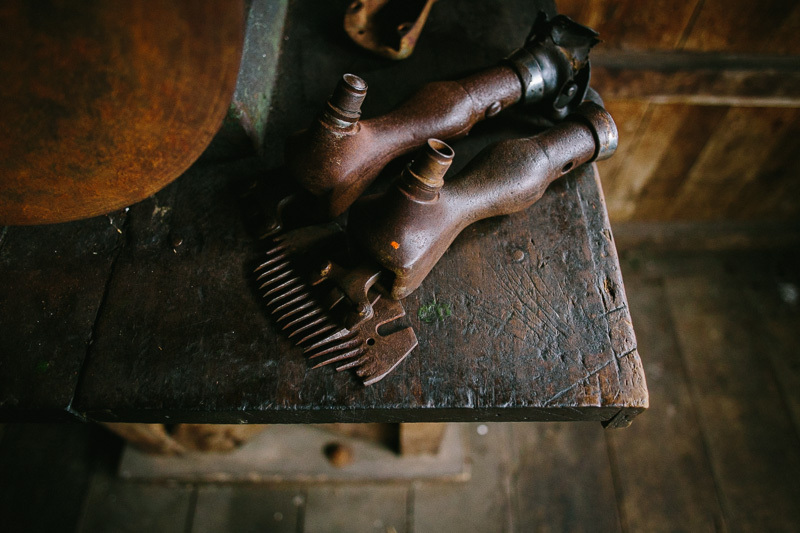 The whole estancia is steeped in history. 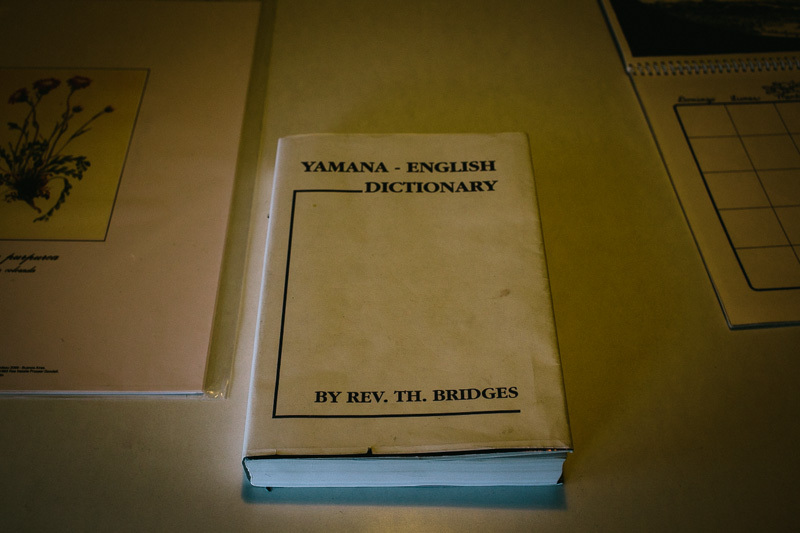 Thomas Bridges compiled the first Yanama-English dictionary. 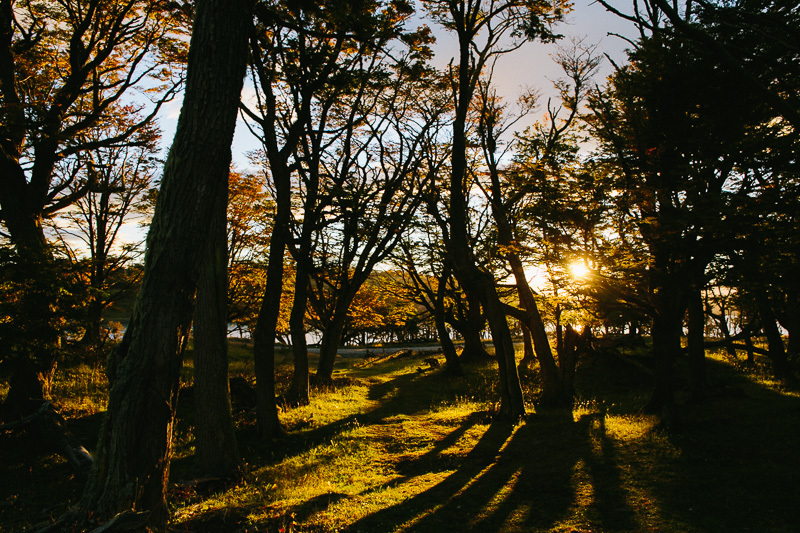 His son, Lucas, followed this up with The Uttermost Part of the Earth, a story that details his childhood in Tierra del Fuego. It’s said to be a classic read. 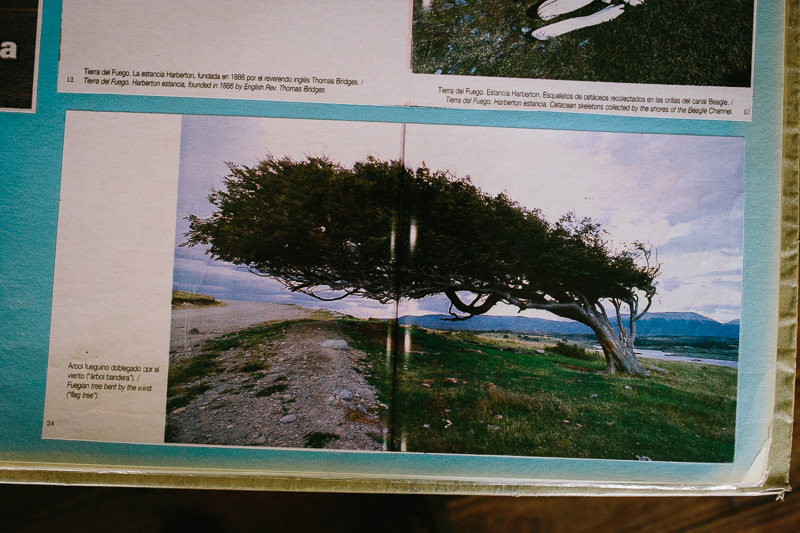 Clippings of the current generation’s exploits in Patagonia also make for a fascinating browse. 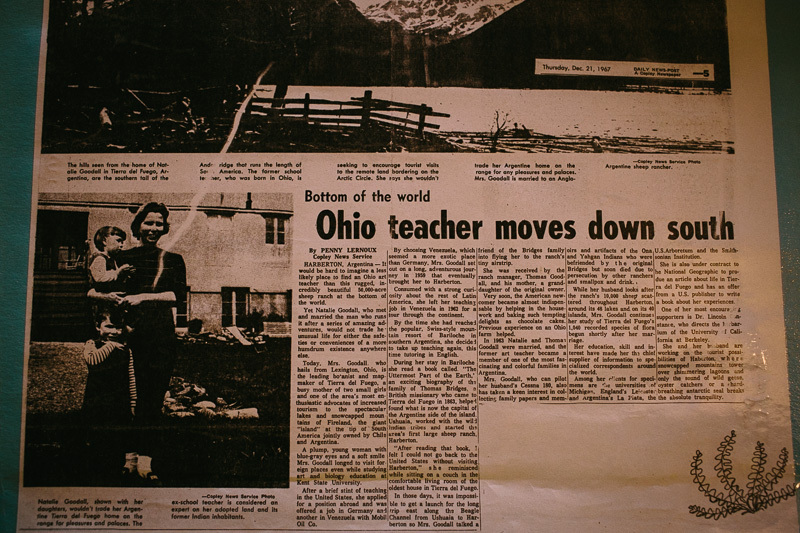 This one, dated 1967, romantisizes the story of Natalie – “a plump young woman with blue-gray eyes and a soft smile” – and her move down south. A particularly evocative example of a ‘flag tree’. Natalie Goodwall, now in her late seventies, is a botanist, map maker, and a renowned expert on Tierra del Fuegan maritime life. 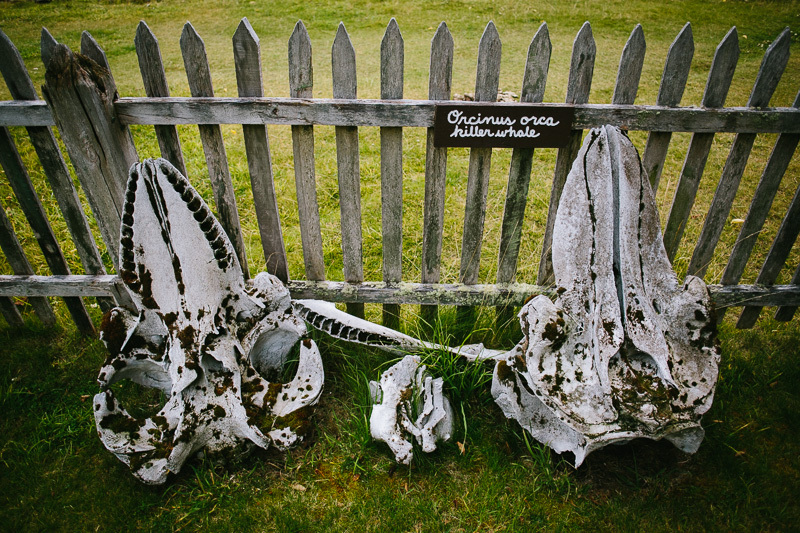 The estancia includes a marine museum; outside, a collection of bones, accumulated over 25 years worth of scientific investigation, gather moss. 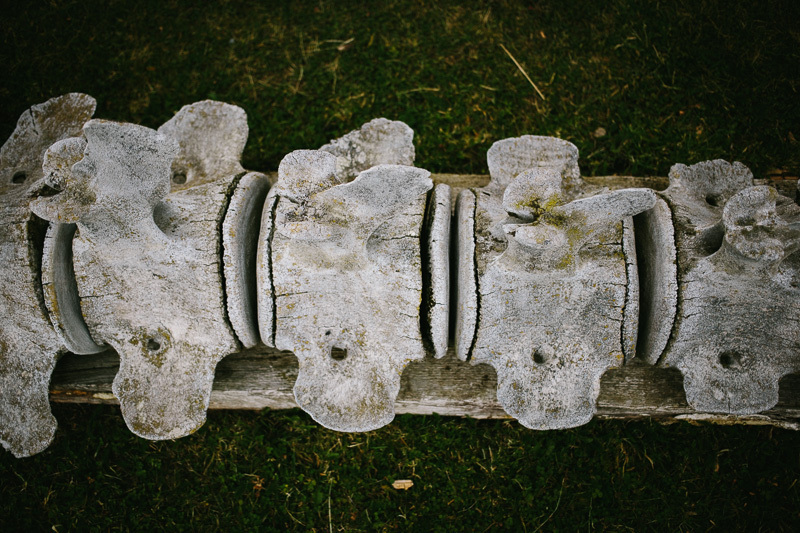 And that’s quite a backbone. 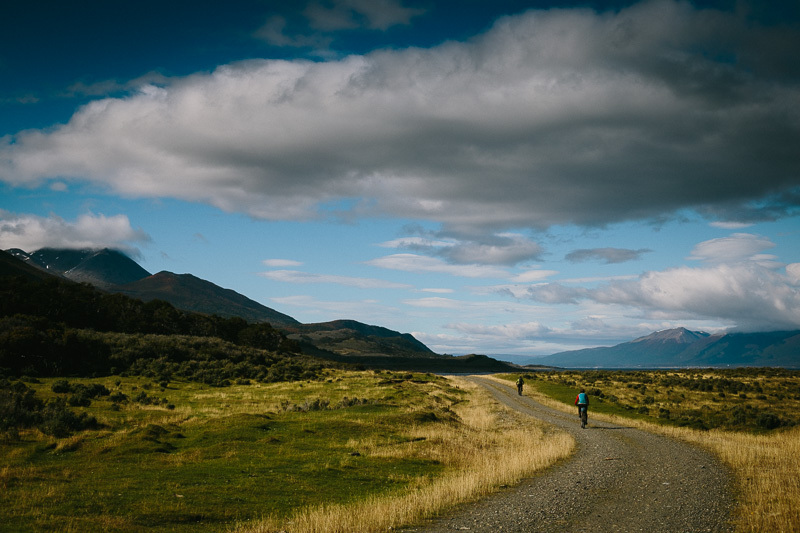 Leaving the estancia, we pedal back whence we came. Back amongst the flag trees, we retrace our steps to the junction near Puerto Almanza. 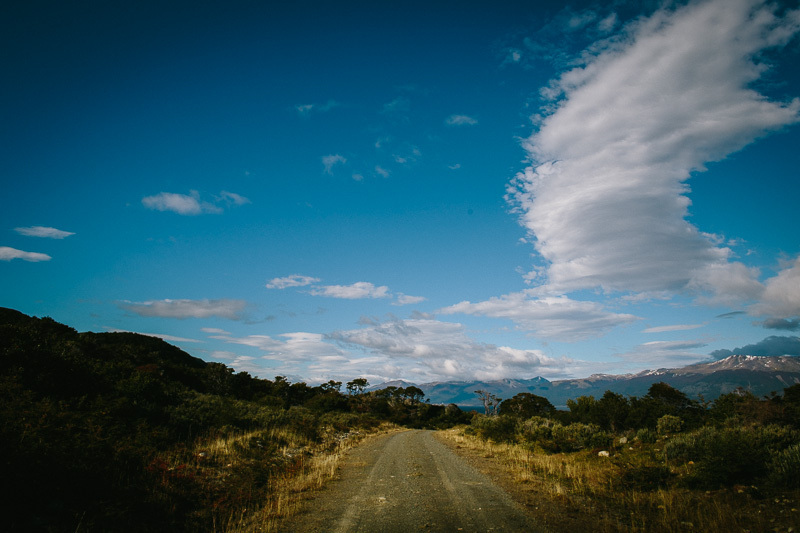 Then we ride the 35km of dirt road to the main highway, before flagging down a vehicle for the final pavement stretch into Ushuaia – which we’ve already ridden. Perfect timing! 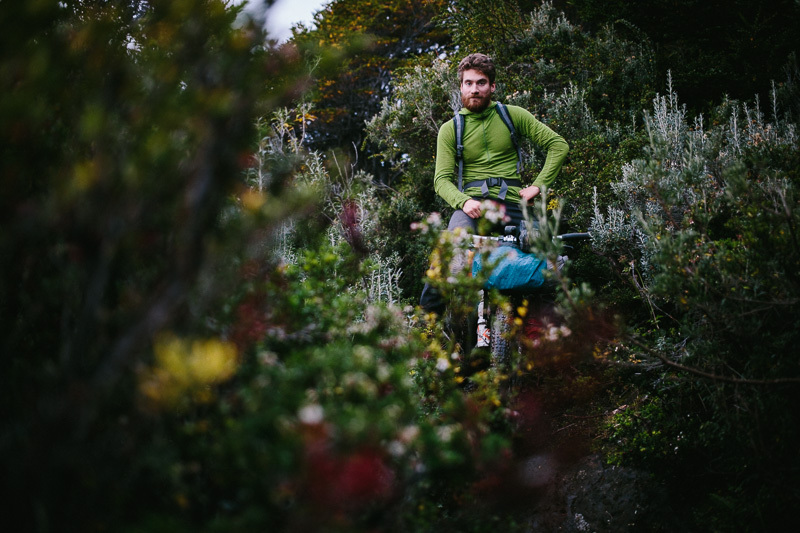 A fabulous bikepack indeed. 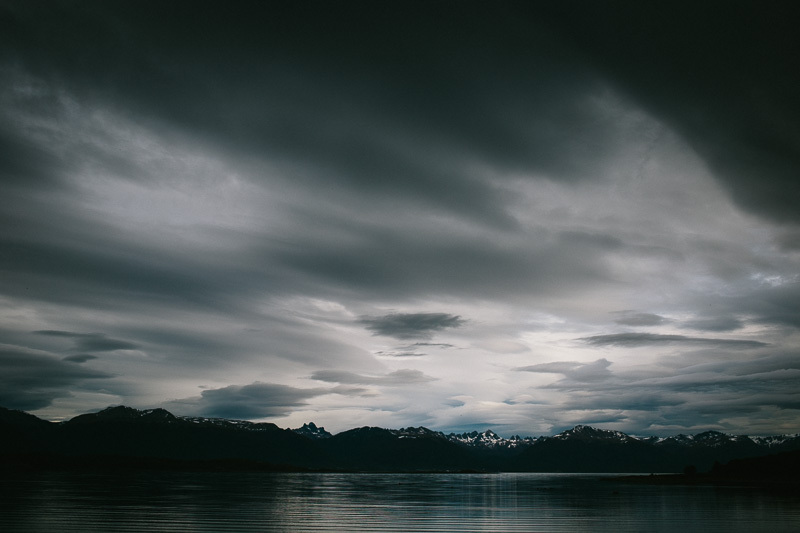 Although an impending winter is ushering me north, I’ll miss Patagonia and its magnificently moody canvas of mountains, lakes and skies. The trail begins around 10km of downtown. 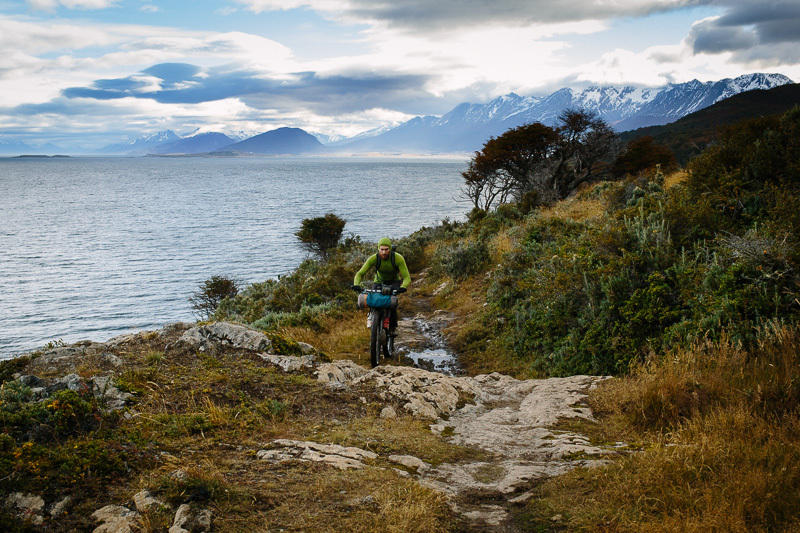 I don’t have the exact total distance to hand – perhaps around 70kms from Ushuaia to Estancia Harberton. We left after lunch on the first day, and spent two nights camping out. 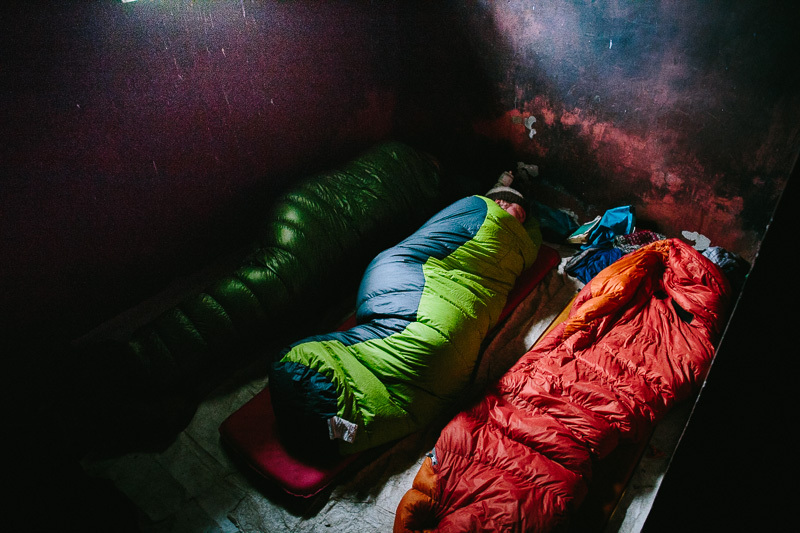 You could probably push through in one long day, camping at the refugio (6kms beyond the estancia) or in the farm’s earlier established campsites (both are free, though in theory required permission). By why rush, when there’s much fine bikeshacking potential to hand. The first section of trail is flowy but steep and rooty in places. Then, there’s a challenging push/bushwack where the trail is very overgrown – approx 5km – before hitting a pebbly beach. Beyond the second estancia, this turns to tractor/compacted beach trail, then two track, then ripio once more. There’s plenty of places for water, including a couple of remote estancias en route. There’s just one gate to be hopped, out of the military area, and a couple of small rivers to be forded. In theory, there’s some basic supplies to be had in Puerto Almanza (we found wine), a delicious-smelling seafood restaurant, and then snacks at the Estancia. 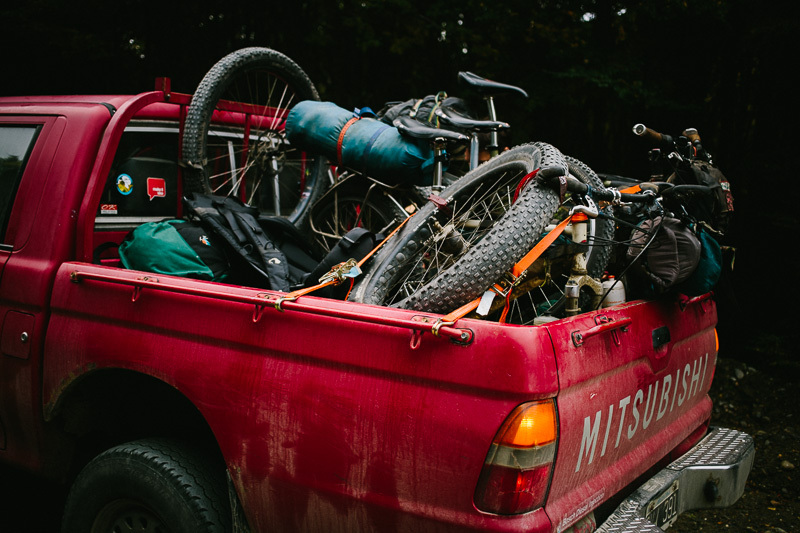 This is a truly fabulous bikepack. If you don’t believe me, check out Kurt’s most excellent account. 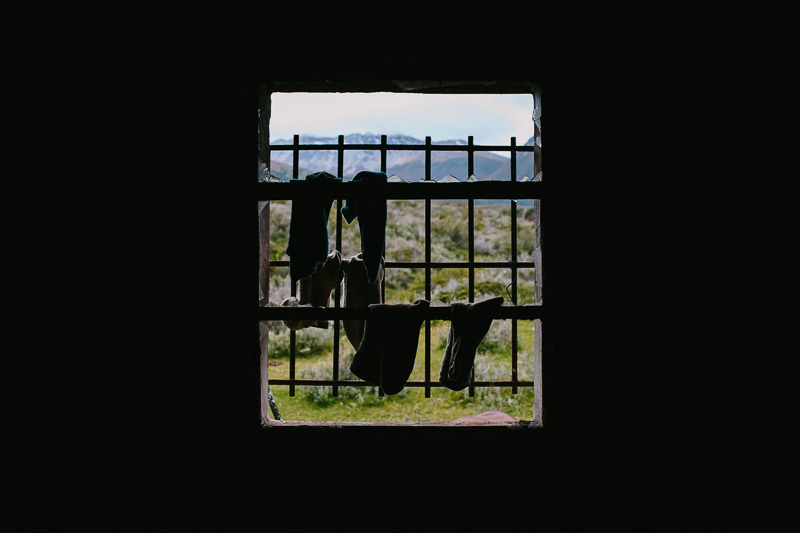 This entry was posted in Patagonia on April 21, 2014 by Cass Gilbert. Nice! Think that must have been yours that I saw on the Cycle Monkey photo feed, then. Enjoy! Be interested to hear how you get on with it, and how easy it is to set up. 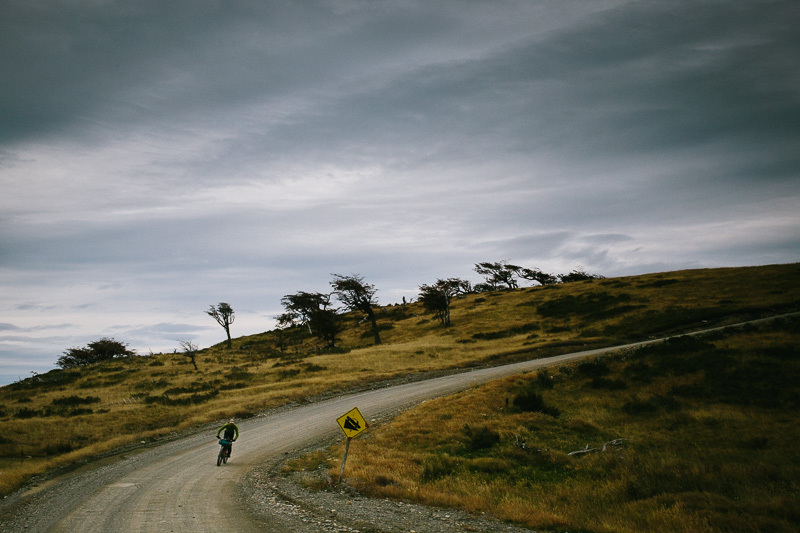 Despite vowing never to ride in Tierra Del Fuego again these pictures are smashing and are almost enough to tempt me back again someday. Only crazy people ride north!! Wow! 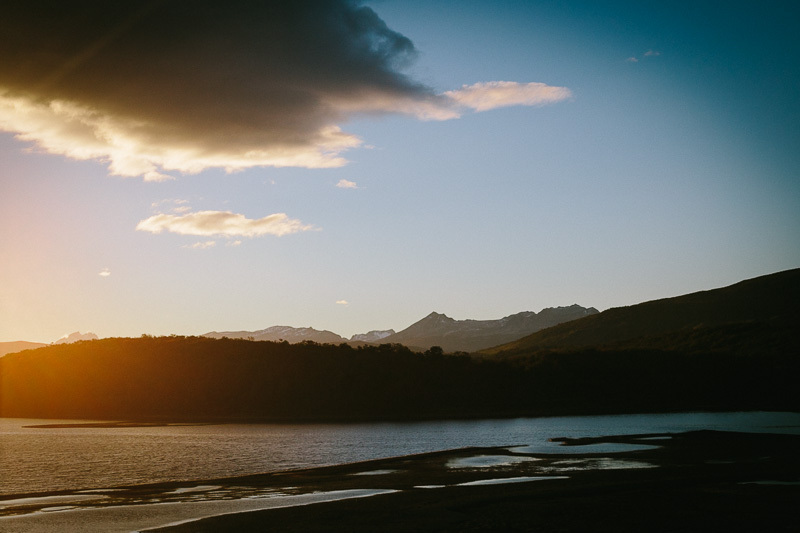 An amazing end to another incredible journey…. Thanks for that little nugget, Bridget! What a wonderful smorgasbord of piccies. I spot the perfect cover for nexts month gay trekker too. Absolutely stunning. Big fan! Keep ’em coming. Thanks Susie. I’m a muesli man myself – weirdly, a brand of supermarket in Chile stocks a few Waitrose products, including some great breakfast cereal! 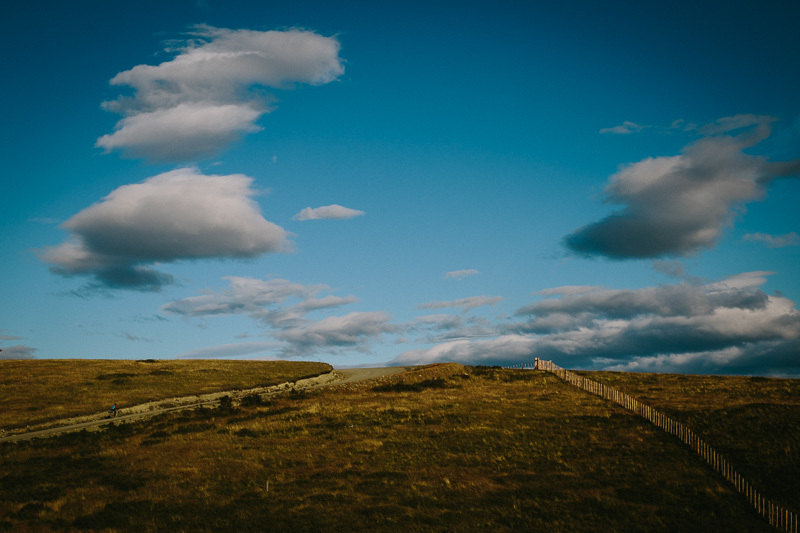 Absolutely captivating shots as usual Cass! I said that before and I may say it again, but your impressions never cease to amaze me! It might be quite a tightrope walk between art and adventure, but you seem to master it blindfolded… Absolutely admirable skill! Best wishes and keep going!! Thanks Oliver. Those are very kind works. I will endeavour to keep it up! Pete, great to hear you made it. Weren’t you heading to Rio? That’s a great blog you have there, beautiful shots. 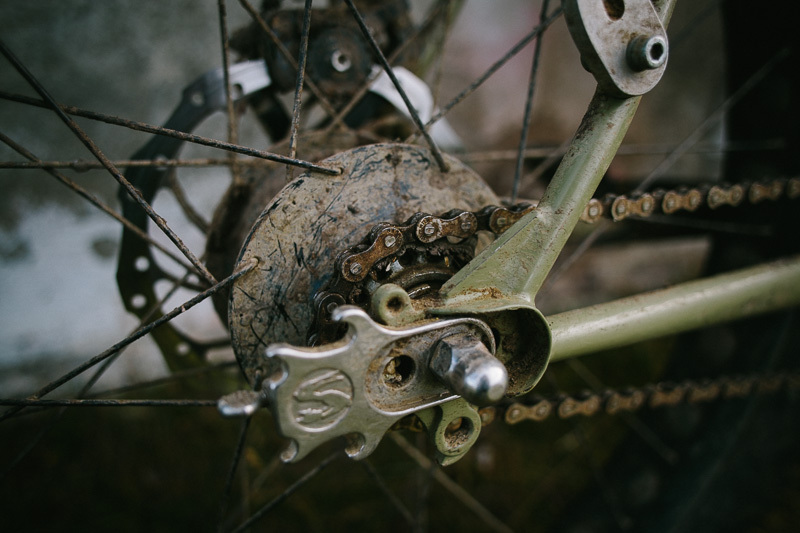 And… your bikes look nice and worn in too, now! 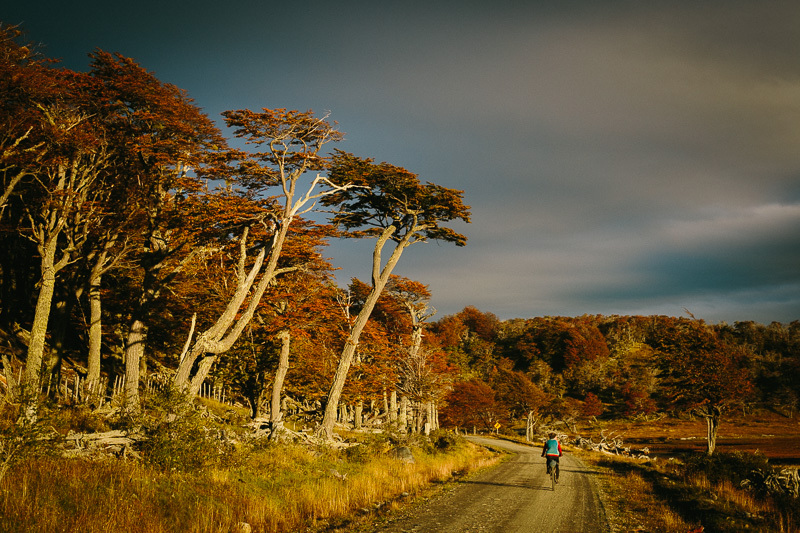 Yer, I was going to ride across to Brazil from Santiago, but everyone I met told me tales of Patagonia, and I was around Santiago when your carraterra austral blog popped up, pushed me over the edge of temptation! Still heading up for the World Cup, however via a flight from here! Safe travels mate! 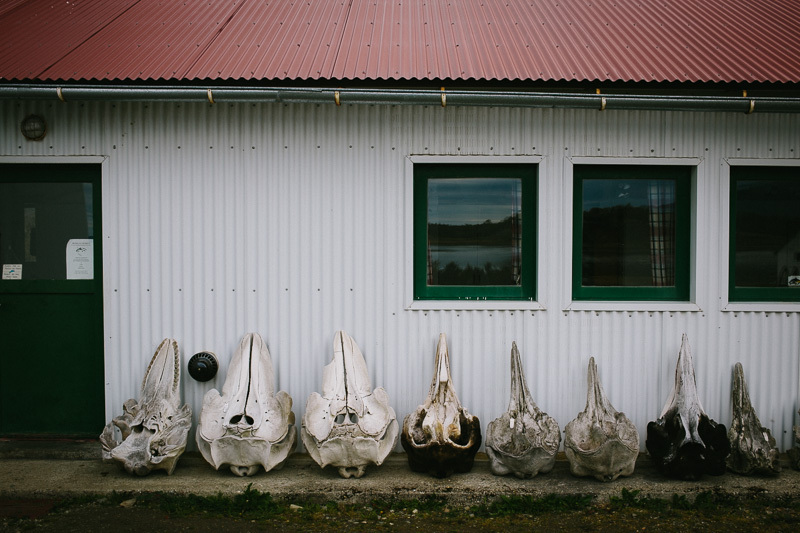 Hi Cass, I was your guide in Harberton ranch, this is a very interesting article, and some photos are excellent. Thank you for let me try your bike. PD: The guy who picked you up in the red truck, picked me up few days before when i was autostoping to the No Top mountain, farther in the way to the small lodge. Your post is so great that, after a friend showed it to me, I’ve tried to do the same route few weeks ago on the Easter day. The guy wasn’t forcing me to leave, he was only warning me about the possible consequences. 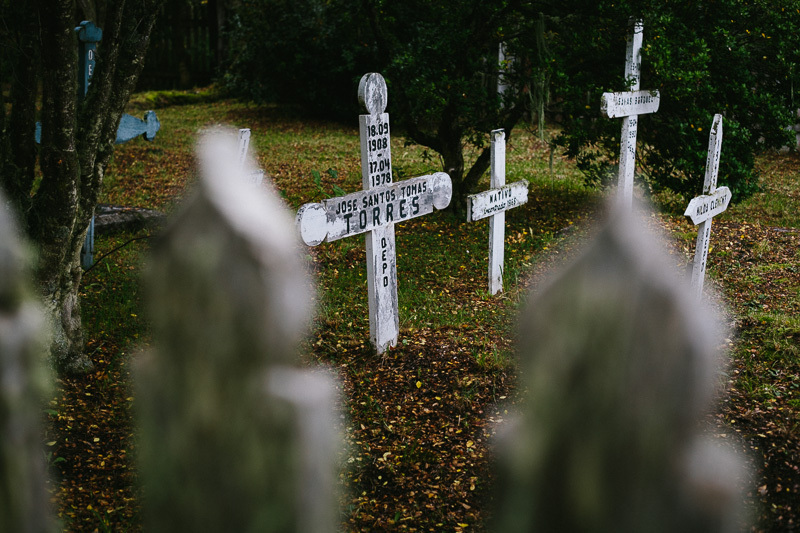 He told me that I could have asked for a permit at a military post close to Puerto Almanza, but he said that he really doubted that they would have granted me one. Since it was too late I didn’t even bother asking. I am sharing my story so that if someone else is inspired by this post and want to try the same trail, is aware that the military area is not abandoned! My suggestions are to try to ask for a permission, or to do it only in weekends (hoping that they do not do any training), or to come up with a great excuse before entering the area so to be prepared in the case somebody stops you :). Cheers Cass, it was the perfect way to roll into Ushaia and bring the trip to a close. Glad you enjoyed it! 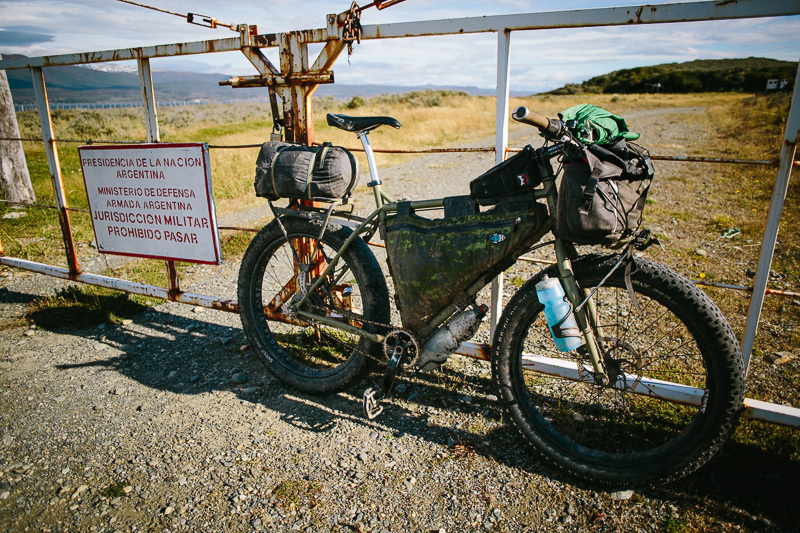 We rode it out of Ushuaia, but I always thought it would make a fitting finale to a trip.